Current USSF "D" License holder Jen Kelly is originally from Marshfield, MA. Jen attended high school at Notre Dame Academy in Hingham, MA where she played soccer and ran indoor & outdoor track. She was a Patriot League All-Scholastic Athlete in both indoor & outdoor track, State Championship and All New England runner in the 600 and 400 meters as well as a State Championship Heptathlete. Jen earned a four year athletic scholarship to Fordham University in the Bronx, NY where she ran the 400, 500, and 800 meter events. She graduated with a Bachelor of Arts Degree in both French Studies and African-American Studies in 1999. In 2004, Jen attended NHTI in Concord, NH, earning an Associate’s Degree in Dental Hygiene in 2006. She is currently employed as a Dental Hygienst at Newmarket Dental in NH. 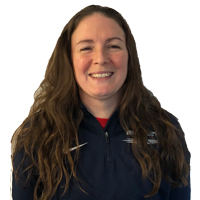 Jen has coached for Seacoast United since 2005, progressing from Grassroots classes and Jr. Academy programs to coaching her first team in 2006. In 2012 Jen became part of the team responsible for fitness testing all the soccer players within the Club and implementing corrective programs from the results gathered.